Watch video of the accountability journalism panel discussion. The 2016 presidential election left many readers with a distrust of the media, who, in their eyes, made a gross misjudgment of the outcome. This left journalists with two big questions: How can they continue holding public officials accountable despite public distrust? What can journalists do better? 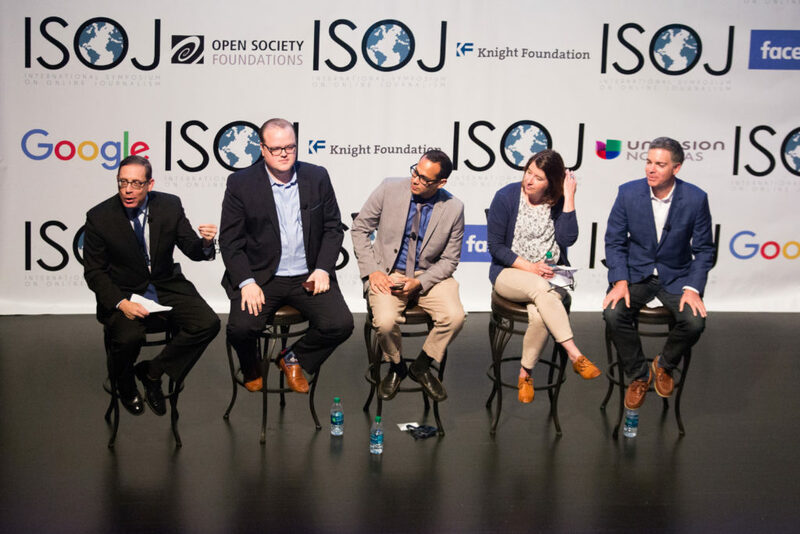 Speakers at the 2017 International Symposium on Online Journalism (ISOJ) panel called “Accountability journalism in the Trump era” set out to answer these questions and more from their perspectives as editors and reporters from across the country. The panel was chaired by Evan Smith, CEO and co-founder, Texas Tribune, and featured McKay Coppins, staff writer at The Atlantic; Sopan Deb, general news reporter at The New York Times; Clara Jeffery, editor-in-chief of Mother Jones; and Matt K. Lewis, senior columnist of The Daily Beast. Deb was quick to refute the idea that there needs to be a vast overhaul of the entire journalism profession, because journalists operate so differently depending on their outlets and their beat. Instead of big changes, Deb said more can be done on an individual basis. Lewis expanded on his point, citing a recent incident where a New York Times sports editor shared a comparison photo that made it seem as though more New England Patriots visited President Obama than President Trump to honor their Super Bowl victories. In reality, the number of players was comparable, prompting the New England Patriots to tweet a correction. Instead of focusing on breaking news or being the first to tweet a photo, Lewis said journalists need to make accuracy their priority. The 18th ISOJ is in Austin, Texas from April 21 to 22, 2017. Live streaming of panels is available at isoj.org in English and Spanish.